SAN JUAN, PR – The organization ‘Humanistas Seculares de Puerto Rico’ presented yesterday in the afternoon a complaint before the Civil Rights Commission for the unconstitutional and reiterated practice of the Police of Puerto Rico using personnel and resources to promote the Christian religion. 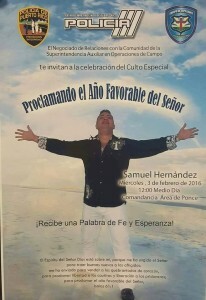 Precisely yesterday the activity was celebrated under the name: “Proclaiming the Favorable Year of the Lord”, which took place in the command center in Ponce at 12 p.m. with the christian singer Samuel Hernández as the main speaker. “While its not clear if public funds were designated for this sectarian activity, we suspect that the famed christian singer doesn’t do free work” said Eva Quiñones, HuSe’s president. In addition to this recent violation to the separation of church and state and the establishment prohibition, the organization denounced that the Police has a constant practice of questionable acts that promote the christian faith. “Let’s remember the incidents with the police officers praying to the homeless while on duty, the ascent of 447 agents to sergeants in an official act carried out in the church ‘Fuente de Agua Viva’ in Carolina, the blockades of faith carried out by the municipal police of Santa Isabel and Barceloneta with the backing of the state Police, the use of public funds for the promotion of religion displaying christian images in multiple marketing forms, activities and even in the command centers of the police” expressed Quiñones. The legal committee director of HuSe, Atty. Mariana Nogales Molinelli added that: “since the police is in a process of reform and revision, we wish to seek an end to the current pattern of violations to the separation of Church and State, establishment prohibition and freedom of worship. Not only do they violate constitutional provisions, but also these actions run contrary to the rules of the police which establish in article 35 (c) the applicability of these precepts”. The Civil Rights Commission reported today that it has already taken affirmative actions and has sent official communications in this regard. The organization continues gathering evidence, and calls upon all those who have photos, documents, and anything else that may indicate the police violates the constitutional provisions of separation and establishment to communicate with them or directly with the Civil Rights Commission. For more information, please visit: http://humanistaspr.org.